Iceland is a wondrous and sparse landscape with few distractions, as the it is the most parsley populated country in Europe. Most of the population lives in Reykjavik, the capital and largest city of Iceland. 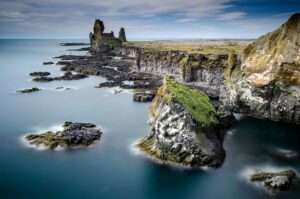 Even with all the natural sites to see inland, such as active volcanoes and serene mountains, the coasts are a sight that will inspire a return to the calm of Iceland’s culture and landscapes. 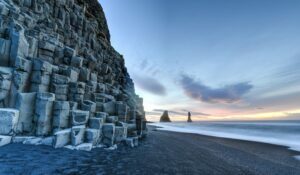 Near the Arctic Circle, Iceland is approximately the size of Kentucky. The coastline is almost 4,970 km of cliffs, glaciers, and beaches. But where the traveler will usually start most journey is in Reykjavik, on the southwest corner of the country. Reykjavik may not be the biggest or most well-known in the world, but the culture is first-class. Art galleries, cafes, bars, and a great selection of restaurants enhance the atmosphere of a low-key and thriving city. The architecture and design are a unique expression of a people removed from the rest of the world, left to create their own style and sense of aesthetic. Heading out on a cruise around the coasts of Iceland is taking in the visions of a growing island. Every year, Iceland rises 5cm. This gives the coasts sharper and more crisp angles where it meets the sea. Stykkisholmur is a stop along the west coast that features traditional wooden houses in a small, fishing village. Kayak in the still waters or hike toward mountains with glorious falls. Other towns along the coast are similar, small and quaint towns with gorgeous surroundings. Each one ready to receive the traveler with a warm welcome. 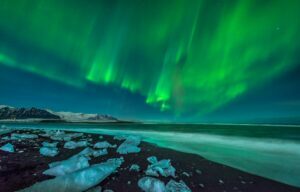 Two of the more amazing sights in Iceland are the watching of majestic whales as they travel in pods and the greatest show on Earth, the Northern Lights. Skalfandi Bay, located at the town of Husavik, is known as the “Whale-watching capital of Iceland”. Here the traveler will get to witness 15 species of whale, dolphins, and 30 types of bird. The gentle giants of the sea are a graceful and amazing sight to behold, but combined with a view of the Northern Lights in the winter months—Husavik provides an entire experience unlike any other. Iceland is a frontier of nature and culture, a place where the land is consistently being born again. The people are community-oriented, the culture a pleasant experience, and the coasts a must-see for the traveler interested in enjoying more unique parts of our world. This voyage is also possible in reverse order (Tour 2).